Thanks, Erin, for this good perspective. 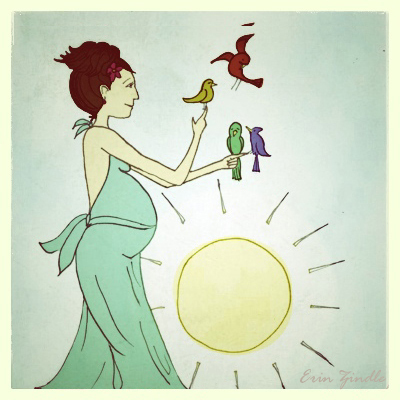 I wasn’t always so patient in waiting – during pregnancy or other times. But right now I can apply it to my current transition. (Seems like my life always seems to be in transition!) We wait for our farm to sell so we can set off to explore other places. In the meantime, much work (sorting & pitching) awaits our attention. The expectancy does help the motivation. My baby will turn 30 Wednesday. After your baby is born you continue to expect as he/she graduates from crawling to walking, babbling to talking, getting on the school bus the first time all alone (you’ll cry, trust me) or watching them drive off in your car the first time after they get their license. Then they will graduate from High School and college. This is what we expect as parents. We give them life, not to run it for them but to guide them so that they can find out who they are meant to be. Enjoy all the little things and don’t be impatient waiting for the next achievement. It’ll all come in due time! Write that little one a beautiful song and share it with us, please? Erin! OMG, I had no idea. Congrats to you and Randall! I have had a real bad week at work, but this news just put a HUGE smile on my face!!!!!!!! I miss you guys SO much as it has been over a year since I have seen/taped you guys! Aw, thanks Z-man! Miss you too! !